Background: Enormous success of antitumor agent cisplatin initiated interest in other organometallic complexes. A subclass of organometallic compounds termed metallocenes, characterized by a transition metal central atom (M) bound to cyclopentadienide (Cp-/[C5H5]-) ligands with the basic formula Cp2M, has gained increasing interest as promising anticancer agents. Objectives: This review summarizes the progress in the development of organometallic titaniumbased compounds focusing primarily on the evaluation of their cytotoxic activity and mechanism of action in relation to potential utilization as anticancer drugs. Results: Metallocenes bearing titanium as central atom were sorted according to their structure and modifications and their anticancer activity is further discussed. Conclusion: Titanocenes represent family of promising compounds exerting cytostatic activity. We suggest that their application not only as separate agents, but also in combination with newly developed carriers, e.g. 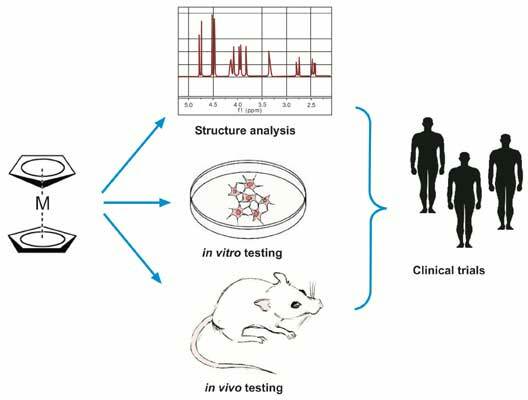 nanomaterials, may lead to improvement of their delivery into tumor cells and following utilization in cancer treatment. Chemotherapy, cisplatin, clinical trials, organometallic compounds, titanocene compounds, titanocene dichloride.